Back in 1983, we all knew that Howard Chaykin was a great talent. But at that time he hadn't had the opportunity to write and draw his own long running series. ...comics need more humor than they have. I think one of the problems with comics today is that they're incredibly humorless. ...FOr the most part, comic book characters today are creeps. They're really creepy characters. They're whiners. They're losers. Wouldn't the same quotes be applicable today? I think for some comics, yes. Other comics, like Deadpool have a lot of humor. Even Green Lantern manages to get some comedy in the action with Larfleeze. Certain other comics go too far, such as the issue in Amazing Spider-Man where Billy Connors gets eaten by his father, The Lizard. Back to American Flagg. 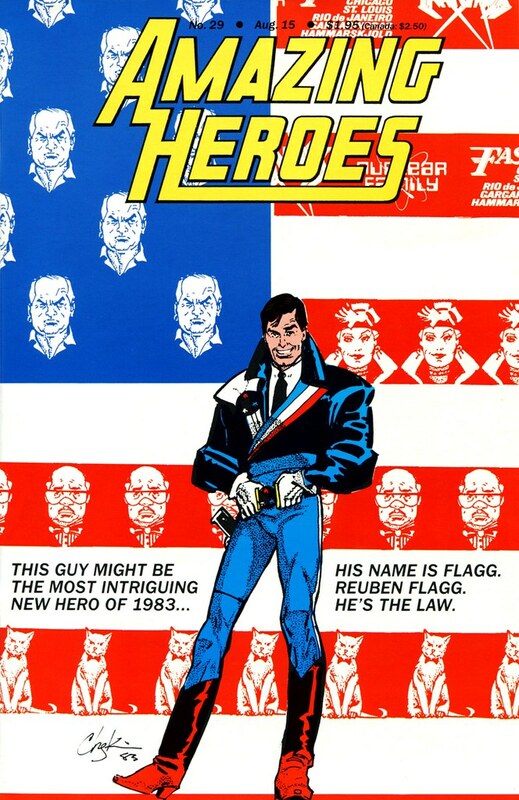 I was thinking before I re-read this quote from Chaykin, what do I remember from American Flagg? I remember the humor and the sexiness of the characters most of all. Raul the talking cat, the corrupt politics, Jaws, and tons of garter belts. I have those issues in a longbox, now I have to dig them out. Nuff Said!